My niece gave birth two weeks ago and I’m thinking of giving her a pretty diaper bag for her baby. 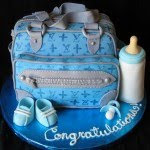 I browsed online for some ideas and after various surfing and looking please see what I’ve found, a Louie Vuitton Diaper Bag Bridal Shower Cake, oops not for newly born but for bridal shower and it’s not a bag but a cake. Could it be that the bride will also give birth as soon as after the wedding, just looking for clues anyway! Well isn’t this cake so cute, oh I love the tiny little shoes and the feeding bottle. If I have this cake I’ll save the shoes lol! Btw if you like this one you can visit more of Elizabeth Marek’s wonderful and unique collections at http://artisancakecompany.com.